The Commonwealth of Jamaica is the fourth largest island nation of the Greater Antilles. It capital city is Kingston on the southern coast, but the most sought after tourist destinations are on the north coast. Moving from the western part of the island east, they are Negril, Montego Bay, Ocho Rios and Port Antonio. What makes Jamaica high on the list of destinations for couples planning a Caribbean wedding or honeymoon is the country's vibrant music and entertainment and its all-inclusive hotel product offering spectacular beaches and world-class service. 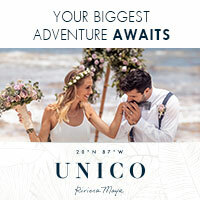 Together they provide the perfect setting for a Caribbean wedding or honeymoon. Romance is in the air in Jamaica and the white, sandy beaches and turquoise water and swaying palm trees and balmy tropical breezes and perpetual summer sunshine put people in the mood for love. The perfect choice for your Caribbean wedding. Make it a Jamaica wedding. The island provides a variety of backdrops for the ceremony and reception, including beautiful beaches, bluffs overlooking the sparkling waters, lush gardens with vivid colors, private residences, resort lawns, restaurants, and places of worship. You choose, and the wedding planners at most resorts will guide you to the perfect event. In addition to world-class reefs for diving there are offbeat bush-medicine hiking tours, congenial fishing villages, pristine waterfalls, cosmopolitan cities, wetlands, and unforgettable sunsets. Although Jamaica is known for its exotic beaches and relaxing atmosphere, nightlife in Jamaica is eclectic with wild parties and late night dancing along with awesome live music. Though a small nation, Jamaican culture has a strong global presence. The musical genres reggae, ska, mento, rocksteady, dub and, more recently, dancehall and raga all originated in the island's popular recording industry. Reggae has also influenced American rap music because they both share their roots as rhythmic, African styles of music. Our Wedding Specialists are ready to assist you in selecting the right destination in Jamaica for your Caribbean wedding or honeymoon. Give us a call for Caribbean wedding packages and more!